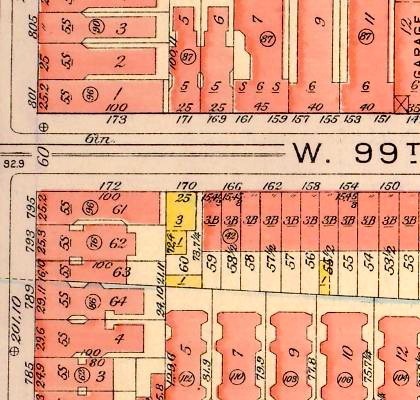 This is a map from 1916 showing 99th street between Amsterdam and Columbus Avenues. Again, the yellow structures on the map are wood. This area was leveled, by the way, for Park West Village. 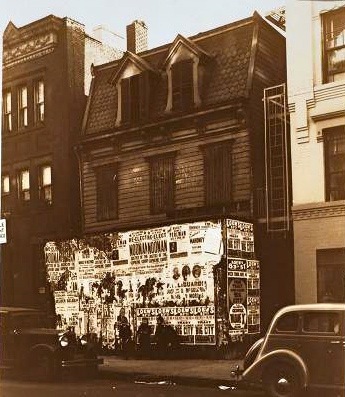 This is the yellow structure on the 1916 map, 170 West 99th Street. This picture was taken in 1932. The house does not appear on the 1867 map. 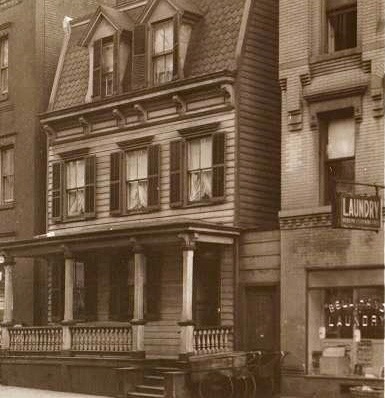 As the blocks became filled in with single family homes as well as small apartment buildings, it was a miracle that the house survived as long as it did. This is the house on its last legs. The posters adorning the front of the house can date this picture. One of the posters is for an MGM picture called Big City. Staring Spencer Tracy, the picture is playing at Loew's 83rd according to the poster. Once upon a time before the 1946 anti-trust litigation was all said and done, Loew's, owned MGM. Big City was released in 1937. Just ask the three kids in front of the house.